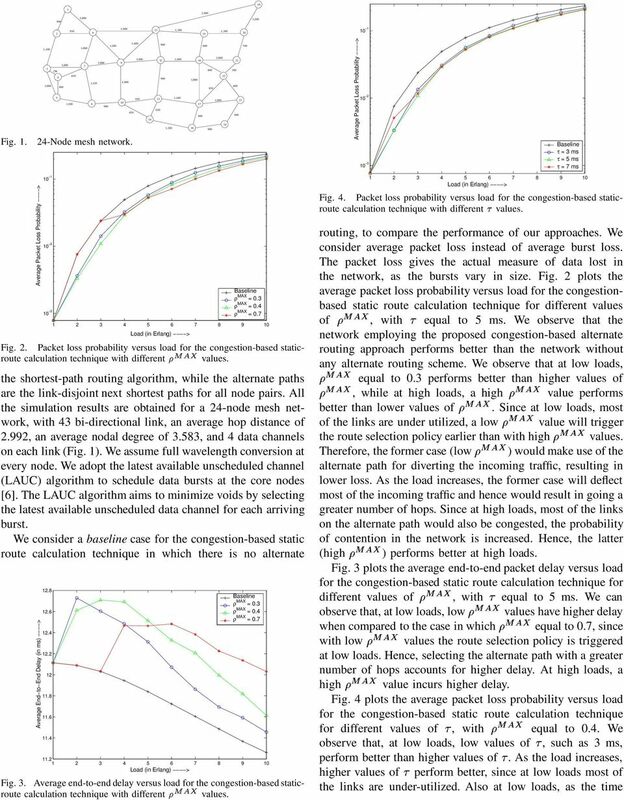 Download "Dynamic Congestion-Based Load Balanced Routing in Optical Burst-Switched Networks"
5 Average End to End Delay (in ms) > τ = 3 ms τ = 5 ms τ = 7 ms Average End to End Delay (in ms) > (dist) (hop) distance based hop based Fig. 5. Average end-to-end delay versus load for the congestion-based staticroute calculation technique with different values. (dist) (hop) distance based hop based Fig. 6. Packet loss probability versus load for the least-congested dynamic route calculation technique. interval,, is short, most of the links on the primary path would signal congestion, and would deflect the traffic onto the alternate path, resulting in a successful transmission. 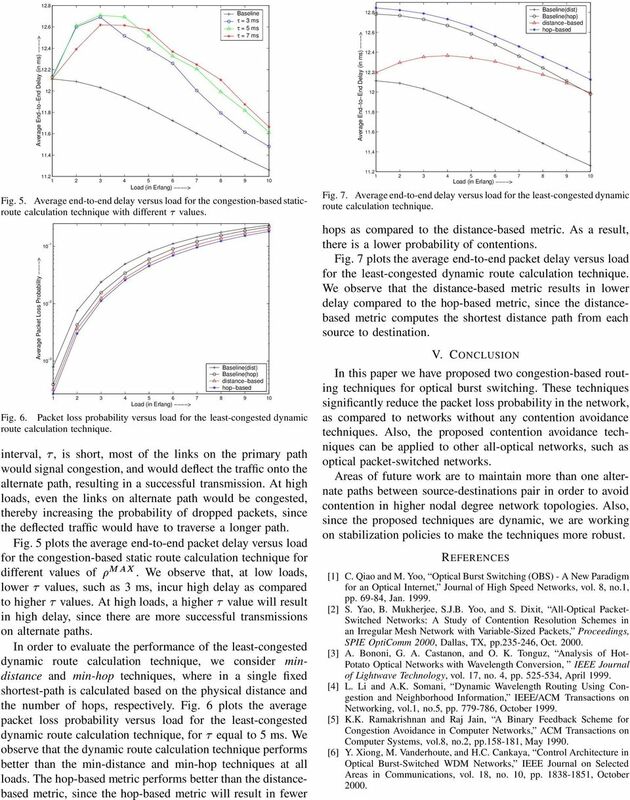 At high loads, even the links on alternate path would be congested, thereby increasing the probability of dropped packets, since the deflected traffic would have to traverse a longer path. Fig. 5 plots the average end-to-end packet delay versus load for the congestion-based static route calculation technique for different values of #$&%('. We observe that, at low loads, lower values, such as 3 ms, incur high delay as compared to higher values. At high loads, a higher value will result in high delay, since there are more successful transmissions on alternate paths. 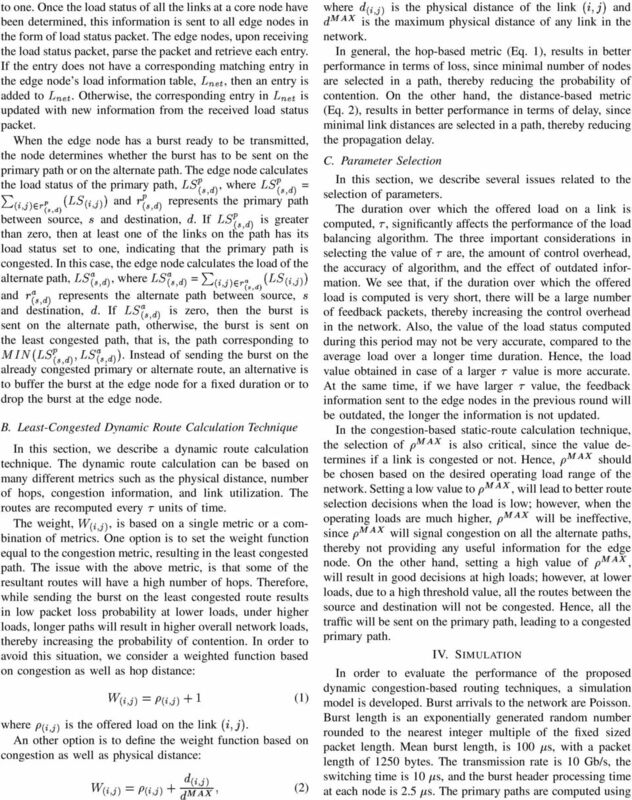 In order to evaluate the performance of the least-congested dynamic route calculation technique, we consider mindistance and min-hop techniques, where in a single fixed shortest-path is calculated based on the physical distance and the number of hops, respectively. Fig. 6 plots the average packet loss probability versus load for the least-congested dynamic route calculation technique, for equal to 5 ms. We observe that the dynamic route calculation technique performs better than the min-distance and min-hop techniques at all loads. The hop-based metric performs better than the distancebased metric, since the hop-based metric will result in fewer Fig. 7. Average end-to-end delay versus load for the least-congested dynamic route calculation technique. hops as compared to the distance-based metric. As a result, there is a lower probability of contentions. Fig. 7 plots the average end-to-end packet delay versus load for the least-congested dynamic route calculation technique. We observe that the distance-based metric results in lower delay compared to the hop-based metric, since the distancebased metric computes the shortest distance path from each source to destination. V. CONCLUSION In this paper we have proposed two congestion-based routing techniques for optical burst switching. These techniques significantly reduce the packet loss probability in the network, as compared to networks without any contention avoidance techniques. Also, the proposed contention avoidance techniques can be applied to other all-optical networks, such as optical packet-switched networks. Areas of future work are to maintain more than one alternate paths between source-destinations pair in order to avoid contention in higher nodal degree network topologies. Also, since the proposed techniques are dynamic, we are working on stabilization policies to make the techniques more robust. REFERENCES  C. Qiao and M. Yoo, Optical Burst Switching (OBS) - A New Paradigm for an Optical Internet, Journal of High Speed Networks, vol. 8, no.1, pp , Jan  S. Yao, B. Mukherjee, S.J.B. 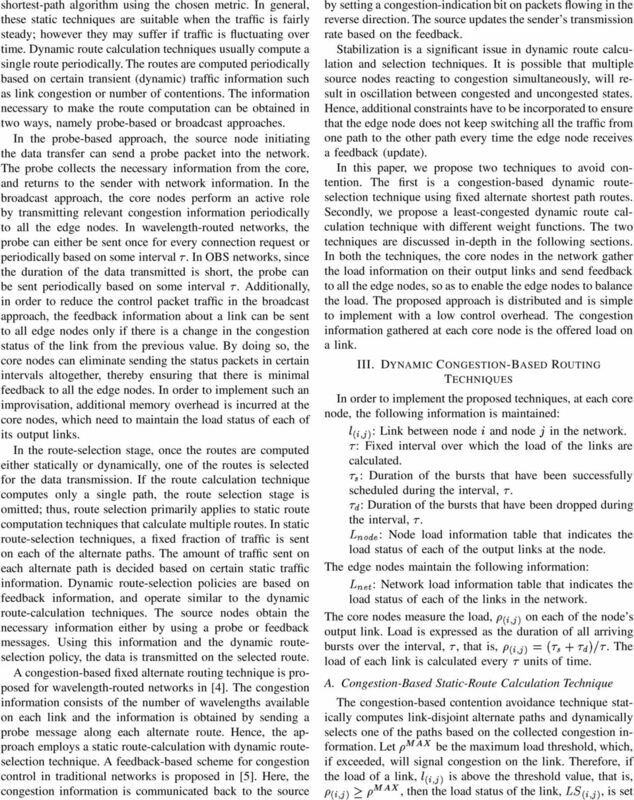 Yoo, and S. Dixit, All-Optical Packet- Switched Networks: A Study of Contention Resolution Schemes in an Irregular Mesh Network with Variable-Sized Packets, Proceedings, SPIE OptiComm 2000, Dallas, TX, pp , Oct  A. Bononi, G. A. Castanon, and O. K. Tonguz, Analysis of Hot- Potato Optical Networks with Wavelength Conversion, IEEE Journal of Lightwave Technology, vol. 17, no. 4, pp , April  L. Li and A.K. Somani, Dynamic Wavelength Routing Using Congestion and Neighborhood Information, IEEE/ACM Transactions on Networking, vol.1, no.5, pp , October  K.K. Ramakrishnan and Raj Jain, A Binary Feedback Scheme for Congestion Avoidance in Computer Networks, ACM Transactions on Computer Systems, vol.8, no.2, pp , May  Y. Xiong, M. Vanderhoute, and H.C. Cankaya, Control Architecture in Optical Burst-Switched WDM Networks, IEEE Journal on Selected Areas in Communications, vol. 18, no. 10, pp , October 2000. Improving the Performance of TCP Using Window Adjustment Procedure and Bandwidth Estimation R.Navaneethakrishnan Assistant Professor (SG) Bharathiyar College of Engineering and Technology, Karaikal, India. Ant Colony Optimization for Distributed Routing Path Optimization in Optical Burst-Switched Networks João Pedro 1, 2, João Pires 2, and Joao Paulo Carvalho 3 1 Nokia Siemens Networks Portugal S.A., R.
Determine: route for each connection and protect them if necessary to minimize total network cost (say wavelength-links). Interconnection Networks. Interconnection Networks. Interconnection networks are used everywhere!